Explanation: When did Orion become so flashy? 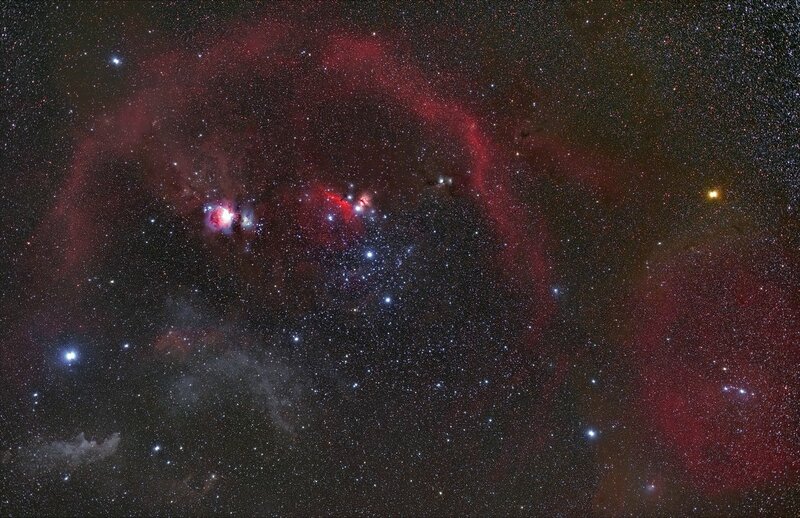 This colorful rendition of part of the constellation of Orion comes from red light emitted by hydrogen and sulfur (SII), and blue-green light emitted by oxygen (OIII). Hues on the featured image were then digitally reassigned to be indicative of their elemental origins -- but also striking to the human eye. The breathtaking composite was painstakingly composed from hundreds of images which took nearly 200 hours to collect. Pictured, Barnard's Loop, across the image bottom, appears to cradle interstellar constructs including the intricate Orion Nebula seen just right of center. The Flame Nebula can also be quickly located, but it takes a careful eye to identify the slight indentation of the dark Horsehead Nebula. As to Orion's flashiness -- a leading explanation for the origin of Barnard's Loop is a supernova blast that occurred about two million years ago. I'll bet scr33d is happy as a clam! This one really pops! Love the red, with just enough blue for pleasing contrast. Well, I can't complain about the level of color saturation of this image, can I? So yes, I like it! There are huge numbers of details to marvel at. Such as the yellow color of the ionization front above which the Horsehead sticks up its head (or possibly another part of its anatomy - ask Chris). I guess the yellow color here is a measure of the brightness of this ionization front. Or, more interestingly, the smoothness of the red curtains behind Sigma Orionis, the multiple star above the Horsehead, versus the chaos and turbulence of broken ghostly reddish pillars above and below the Orion Nebula. Or the startling black emptiness in Barnard's Loop at about 2 o'clock, which looks a bit like a gaping mouth. Or the beautifully detailed M78 at about 9 o'clock, surrounded by a lovely necklace of stars. Or the apparent little "man" sitting on a red raft or tongue of nebulosity on the opposite side of Barnard's Loop from M78, at about 7 o'clock. Or the various faces and figures and trolls and birds that I can spot in the chaotic shapes below the Horsehead Nebula. Pareidolia anyone? I have two complaints. I don't much like the green color of many of the bright blue stars in this picture, such as Alnilam and Mintaka in Orion's Belt. 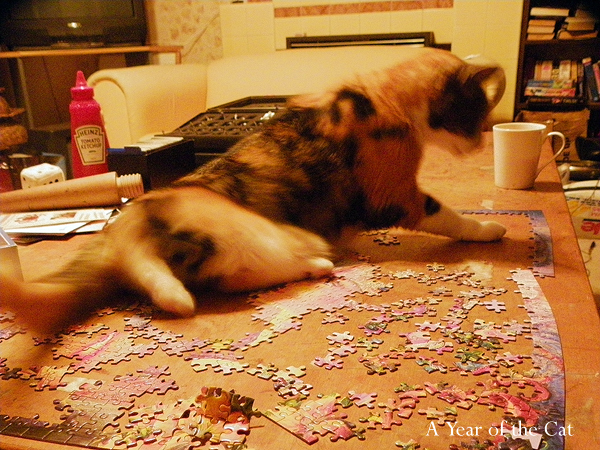 And speaking of Orion's Belt, Alnitak is really hard to spot here. But hey, I really like this picture! Why does the blue in the uper part of the picture differ from the blue green below and to the right of it. The blue green is identified as Hydrogen and Sulfur (SII+) which doesn't make sense to me (but I don't have access to the spectra. It looks like a very satisfied Cookie Monster. The blue border surrounding the Orion Nebula would be blue reflection nebulosity, where light from the hot blue stars in the Orion Nebula is reflected in the dust in the outskirts of it. 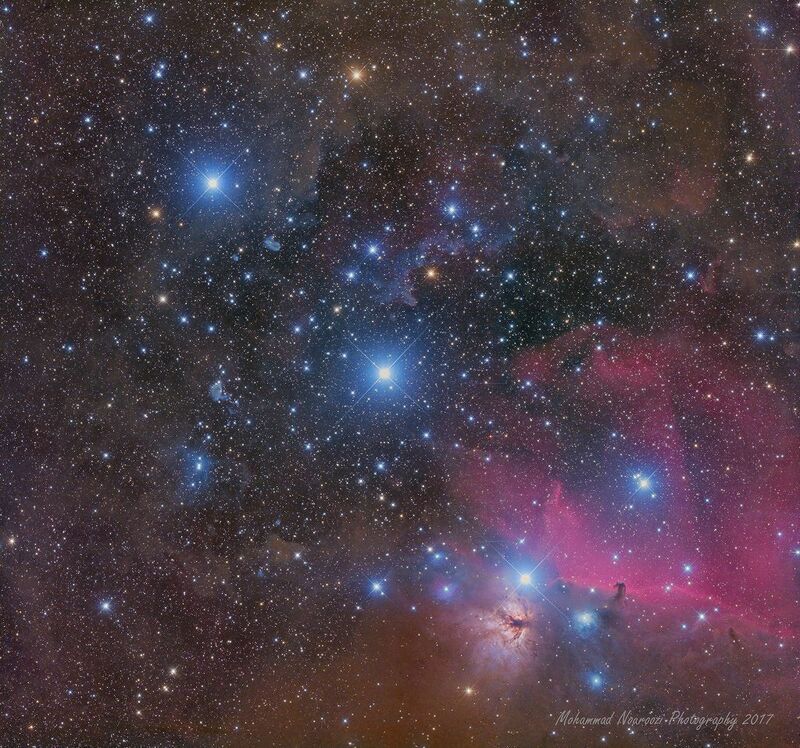 Why don't we see reflected blue light closer to the Trapezium, the innermost part of the Orion Nebula? Probably because the blue light there is swamped by brilliant Hα and OIII emission from ionized hydrogen and oxygen gas. But there is red light everywhere around the Orion Nebula. It seems reasonable that the blue light surrounding the Orion Nebula is slightly "contaminated" by the red light surrounding it. Now take a look at Orion's Belt and Alnilam. Can you see that the otherwise nearly ubiquitous reddish Hα background seems to come to a stop near Alnilam, the middle star of Orion's Belt? And can you see, too, that there seems to be very many small blue stars surrounding Alnilam? Parallax measurements suggest that Alnilam is farther away from us than the other two stars of Orion's Belt. It may or may not be slightly older than the other Belt stars, too, but in any case it seems to be the central star of a fairly rich young association of blue stars. Together, these numerous blue stars may have blown away the gases around them, so that there is no hydrogen gas left in the vicinity of Alnilam. If there were, Alnilam would produce its own red nebula, because Alnilam is hot enough to make hydrogen glow red. So there is no hydrogen sufficiently close to Alnilam for Alnilam to ionize it and make it glow red. But Alnilam itself produces copious amounts of blue light, and all the other small stars surrounding it also produce blue light. There are some astrophotos that show that dust along our line of sight to Alnilam and its association is lit up faintly by the light of Alnilam and the other blue stars and is made to glow faintly blue, as in this photo by Mohammad Noaroozi. And by the way: There is no obvious OIII light in the ESO picture that you can see in my post, and my impression of the APOD is that there is not too much OIII in that picture, either. That is because OIII light is typically seen very close to very hot stars, not farther away from the hot stars than the red Hα light.